The best way to describe this vehicle’s style is urban chic fun that is easy on the eyes as well as the pocket! Chic styling, excellent safety, economy, spacious well laid out cabin, luxury feel, powerful engine control, and much more are all there for you to enjoy. 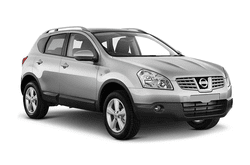 The Nissan Qashqai is a newer model but it is quickly gaining popularity for its power, comfort, and style and is becoming a popular choice for car rentals in the area. With seating for 5 and the standard 5 door layout, you can easily enjoy all the amazing features that this chic car has to offer. When you need a rental car, you don’t have to give up style for comfort or affordability, get it all and more with the Nissan Qashqai!